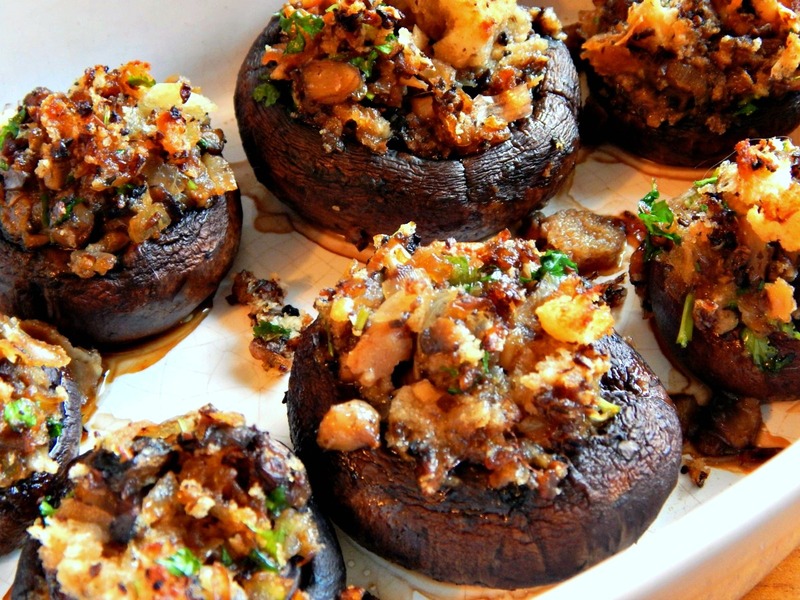 A fantastic budget item for the buffet, these Stuffed Mushrooms are a bit different from some. A moderate amount of Sherry or Marsala adds a lot of flavor, but they’re dry roasted in the oven. The mushroom flavor intensifies, and these are every bit as good with a plain old button as they are with any of the fancier mushrooms – even better as they’re a bit more tender. At a dinner party a few years ago, I set these out for the adults along with a few “kid friendly” appetizers while I finished up dinner in the kitchen. The kids positively inhaled these and asked for more! When I later commented what good eaters the children were, the parents confessed the kids all thought they were meatballs! The lights were a bit low. Think about bringing a tray of these to the next party you’re invited to – just call ahead to make sure it works out ok for the hostess if you bake them off there. So much better (and so much more inexpensive) than bringing chips and dips! While I sometimes add a bit of cheese to the top, Parmesan, Romano or perhaps Fontina, I most often serve them just as is. I do look for mushrooms relatively even in size, although I’ve found that the packaged ones always vary. Then I just make do. The Marsala always seems to be quite a bit more intense in flavor than the Sherry, and if you’re worried these might be too “winey” (they are) either broth or water could be used for part of the wine. Remove stems from mushroom, finely chop and set aside. With a spoon or melon baller, carefully clean out the insides of the mushrooms. Place the mushrooms in a bowl, sprinkle with a pinch of salt, drizzle with olive oil, making sure they are well coated. Melt the butter in a small skillet, add the chopped mushroom stems, onion and thyme, cooking until tender and brown. Remove from heat and add sherry or Marsala, then return to heat and simmer until the liquid evaporates. Turn off heat and add parsley and garlic. Lightly mix in breadcrumbs, season to taste with salt and pepper, keeping in mind that the seasoning is going to flavor the mushrooms as well. Mixture should not be wet, but breadcrumbs should look moist. Drizzle with a touch more wine if needed. Spoon a scant teaspoon to a tablespoon of the stuffing into each mushroom, place on a rimmed baking sheet. May be made several hours ahead and refrigerated, covered. Preheat oven to 350 degrees. Drizzle very lightly with a touch of olive oil, if desired. Top with a little cheese if desired. Bake until tender, about 25 minutes. Use a coupon matching site! One of my favorites in my area isPocket Your Dollars, but every store has a group of enthusiastic Coupon Matchers. Do not discount the savings! I check their site every week, even if I don’t “need” to go to the store and often find bargains I can’t pass up. This entry was posted in Click here for Fabulous Food Posts and tagged Appetizer, breadcrumbs, Frugal Hausfrau, mushrooms, stuffed mushrooms, Vegetable Side, Vegetarian Meal, Wine. Bookmark the permalink. Mouthwatering mushrooms and invaluable tips! Thanks! I try to put the tips for shopping on most of my recipes. I don’t think eating well should ever be limited by budget! Thanks for stopping by and commenting! These really are a favorite! The stuffed mushrooms look terrific. Dimming the lights a mealtime not only adds a certain ambiance, but it eliminates the potential for pesky meal-related questions. Nice work. One question- could someone stuff mushrooms with chili? Lol! I think the kids had wanted to light all the candles in my house (and then put them out with my “snuffer” then light them over and over! But I hadn’t thought to “leverage” that idea for future dinner parties. I love the idea of green chili and tequila. I have done a Margarita Chili- http://wp.me/p4cVtU-2s, but this would be totally new ground. I think I’m going to have to try your Margarita Chili – with Margaritas, of course! This sounds really, really good! I love stuffed mushrooms and love the combo of stuffings here…pinning it up…thanx for sharing this recipe.. Thanks! I hope you enjoy them as much as we do! I did, too – these and halloween candy! These are great. I never think about making stuffed mushrooms but I sure enjoy them. Thanks for the great idea for my next appetizer, which will most likely be very soon with the holidays approaching. It seems they’re just around the corner! The older I get, the faster they come! Here I am, waiting for trick or treaters – and not a single one yet, and me with a bowl of candy…dangerous! Last year, we had a ton by this time – sixish. I always make sure to buy the kind of candy I don’t like! Happy Halloween! Ha! Great idea! Fortunately, I already ate most of the ones I liked out of the giant mixed bag so I don’t have to worry about it anymore…I usually keep it in the trunk of my car until Halloween, but thought I was stronger. Beautiful stuffed mushrooms. One of my favorite appetizers. Another great frugal and delicious recipe. Thanks! And now they have the added bonus of being “retro!” from what I understand…lol.